Know how to protect your rental property. When you buy a home, you buy homeowners insurance—usually. The exception? When the home you own isn’t for you to occupy. Rental property, whether a single-family home or one split into multiple units, is a whole different ballgame in terms of insurance. Although one or more parties call the place home, homeowners insurance typically does not provide appropriate coverage for a residence that primarily generates rent. That’s why someone (surely some brilliant forbear of ours) established landlord insurance. While not required by law, landlord insurance is strongly recommended by experts and landlords alike. 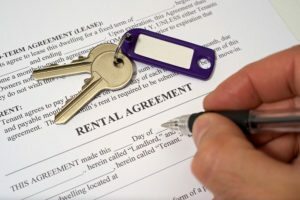 Considering the legalities and range of scenarios that could occur, forgoing this type of policy could prove the biggest mistake of one’s landlord-ing life. Why doesn’t a homeowners policy cut it? In a word: risk. The risk for both costly property damage and personal injury claims tends to increase when a home’s occupants are not the owners, especially when residency changes with frequency and regularity (think vacation home). This stands to reason, since a) non-owners may treat property with less care than an owner-occupant would, and b) a higher number of residents and guests equals a greater chance of injury and other mishaps. An insurance policy tailored specifically for investment property owners serves to best protect all involved. So, what does landlord insurance cover? Severe weather, accidents and even criminal acts can affect any dwelling at any time. For landlord insurance, most insurers offer three levels, respectively providing basic coverage, broader coverage, and broader coverage still. The first level covers certain named situations (such as fire, hailstorms and theft), while the second does the same but for a longer list (such as fire, hailstorms, theft, pipe freezing and trees crashing). The highest level, known as “open peril” or “special form” coverage, covers anything that the policy doesn’t expressly exclude. Landlord and homeowners policies typically exclude flood, earthquake (these require separate policies), damage due to negligence and intentional destruction. Additional exclusions are possible, depending on geography and other factors. When are you liable for personal injury? To illustrate, imagine that someone stumbles and falls while walking up the driveway of your rental home. If the incident was due to a bout of vertigo, with no safety hazard evident, a claim would likely fail. On the other hand, if the stumble was over a buckling crack in your driveway’s aging asphalt, well, that fall could fall on you—maybe heavily. (Remember, these aren’t the friends and family who visit your own residence; a revolving door of strangers is likely to be less forgiving.) As even the most responsible among us are guilty of a few property imperfections, it’s wise to make sure your policy includes liability coverage. Unlike the home in which you live, your rental property helps make your living; it may even be your bread and butter. If an event were to render a unit or the entire structure temporarily uninhabitable, the financial consequences could range from highly inconvenient to downright catastrophic. That’s when this piece of your landlord policy would come into play. As with homeowners insurance, don’t forget those miscellanies when building your landlord coverage. Personal property (such as carpets and other furnishings) and equipment breakdown are common examples of additional considerations. As important as it is, insurance can be complex—especially if it’s a type that’s new to you. Come talk to the Dowd Insurance Agencies to learn more about landlord insurance and designing a policy that works. Whether you’re flipping houses or contemplating the future of one you’ve long loved, we’ll strive to make you feel at home. Life Changes Fast: Is Your Coverage Keeping Pace?